Of all the things that have changed since we brought Corban home from the hospital, perhaps the most unexpected is my relationship with our house. In the almost three and a half years that we’ve lived here, I don’t think I ever truly took pleasure in our home until I started spending a lot more time in it while on maternity leave. For 3+ years, I woke up every weekday morning, scrambled to get out the door to work, rushed to the gym or another activity after work, perhaps making a brief stop at home to cobble together some sort of dinner, and then came home to crash in bed and repeat it again the next day. 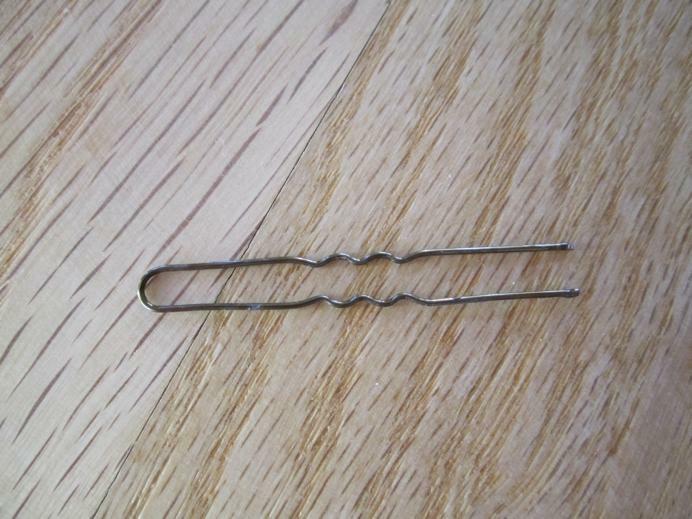 On the weekends, I spent most of my time at home undertaking cleaning or yardwork tasks — clearing piles of clutter, dishes, laundry, papers, etc. that had accumulated during the week. That’s an exaggeration, but the truth of it is that my time at home was more often than not a pit stop between time spent elsewhere, which made our house a dumping ground, and therefore a battleground on which I constantly struggled to undo the mess that inevitably creeps up when your home is more a storage facility than a sanctuary. In theory, I cared about making our home the place I wanted it to be — painting various rooms, decorating for different holidays, updating a few things — but in reality, it didn’t bother me on a daily basis that it wasn’t. I didn’t spend enough time there to care if there were pictures on the walls, curtains on the windows or even a Christmas tree. When my pregnancy-induced nesting instinct kicked in, I finally checked a few things off my to-do list of home improvements. You may have read about some of them. But I still was rushing around — more than ever, actually — and home was the place where I slept more than anything else. But now that I’m not working, everything seems different. My job is to feed a hungry little boy who at times ties me to the couch for seemingly hours on end (this is getting better, finally), and I’m finding that I finally have time to get joy out of our physical home. I spend time just being here, and I look around and remember why we bought this house. I delight in the lovely open floor plan with lots of light. I look at the pictures I finally placed in the frames hanging in our family room, and I think, “how nice!” I start to get crazy thoughts about decorating for Valentine’s Day. I have a whole new perspective now that I spend most of my time here. Sure, I still struggle with laundry piles and dirty dishes and the like (and I admit I have an ongoing battle with clearing the clutter), but those war zones aren’t my focus all the time now. I must say, it feels really nice to get pleasure out of our home instead of battle it. On that note, I did actually do a tiny bit of Valentine’s Day decorating. I was shocked that I even had the urge, but I guess this nesting thing is no joke, and it continues well after the baby is born. Inspired once again by Pinterest and saddened that our door was bare after finally taking down our Christmas wreath, I decided our front door could use a wreath for all seasons. 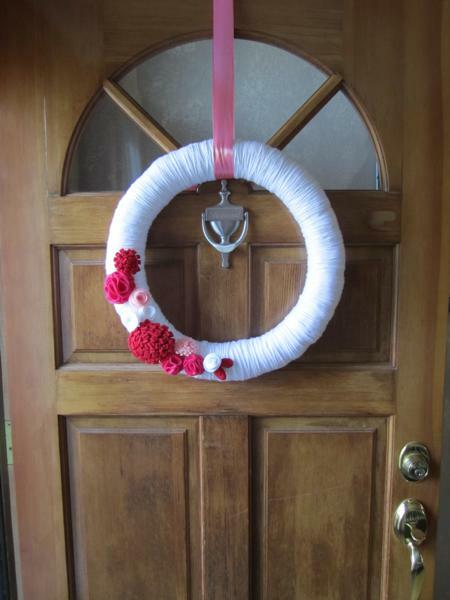 I had a hankering to make one of those yarn wreaths that seem to be all the rage on the Internet these days, but create it in a way that I could update it for various holidays by switching out different colored felt flowers. It’s a good thing I started this project mid-January, because wrapping yarn around an entire wreath is a time-consuming endeavor, and large chunks of free time are just not a part of my life right now. 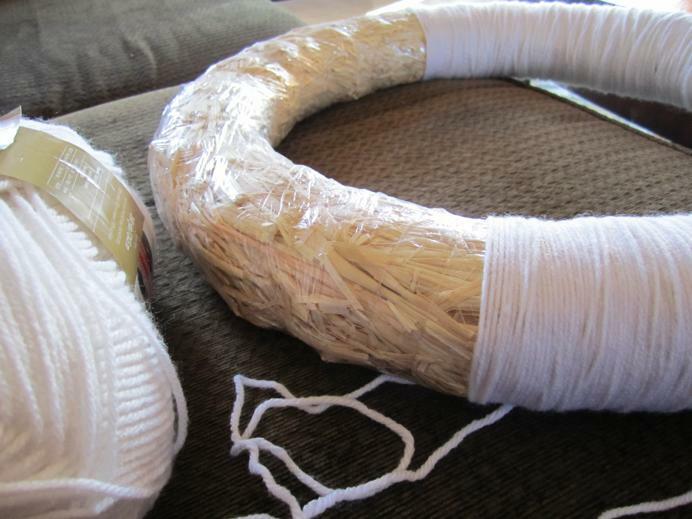 With spare minutes spent here and there wrapping, wrapping, wrapping white yarn around a wood wreath (still in the packaging — important to note! ), I finished up last night. You could probably finish it while watching one or two episodes of “The Bachelor” if you don’t watch “The Bachelor” while nursing your infant. 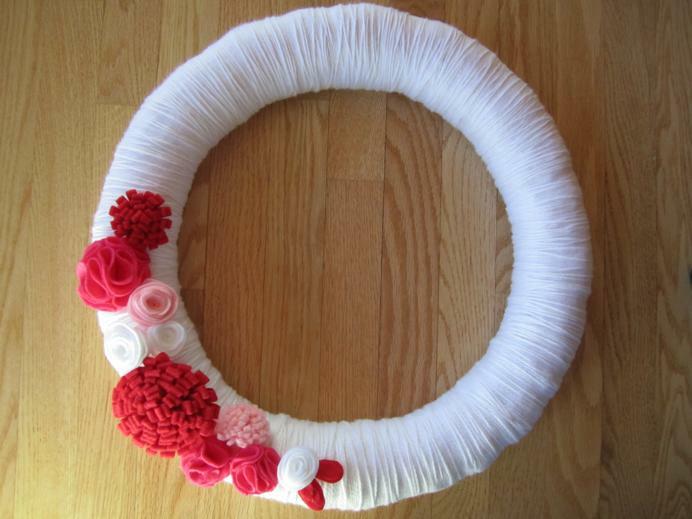 My plain, white yarn wreath is a blank canvas for festive flowers. 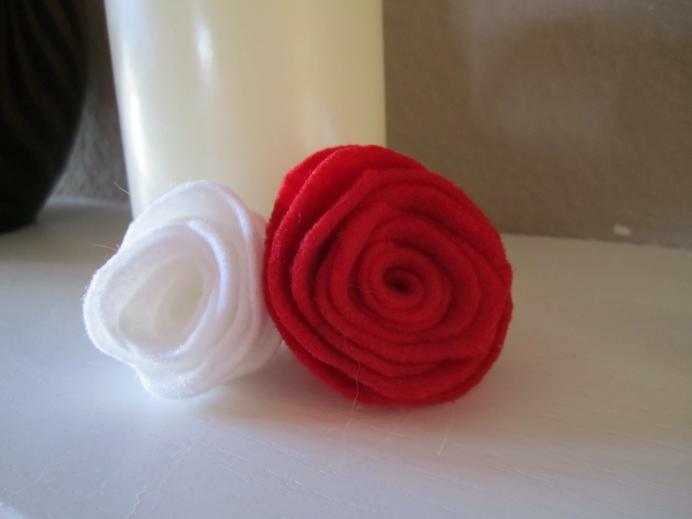 And festive felt flowers, as it turns out, are way easy to make! I used this tutorial to make the roses, this one for the layered, bright pink flowers (except I cut circles instead of flower shapes) and this one for the fringy ones like the big red one. The bright pink ones were the most time consuming, but the roses and the fringy flowers (not sure how else to describe them) were a cinch. 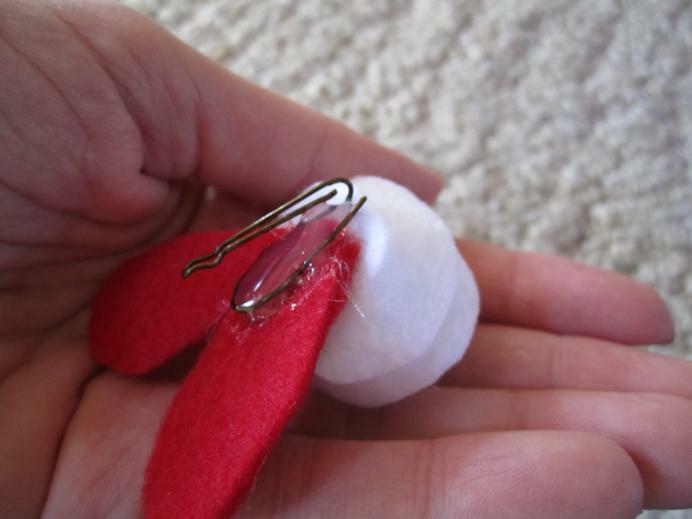 All you need is felt (24 cents a sheet a Michaels), scissors and a hot glue gun. 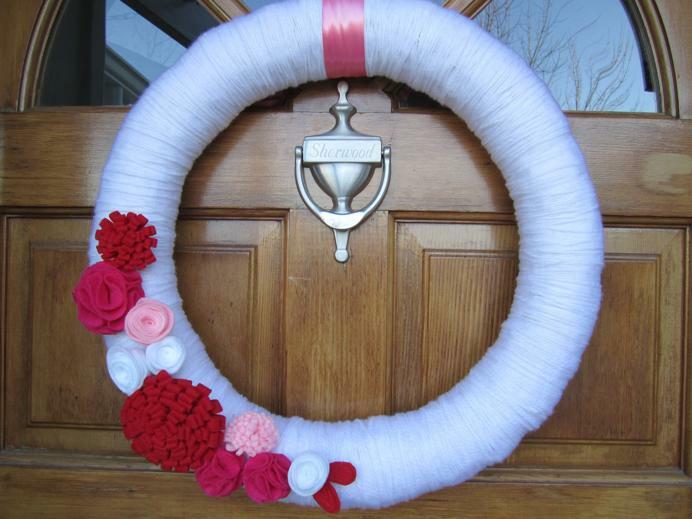 Then you can arrange the flowers on the wreath without gluing them permanently on. 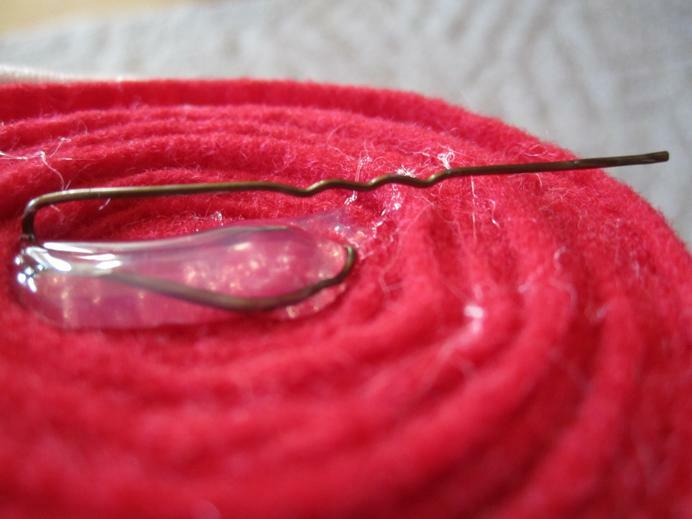 Just poke the bobbie pins through the yarn. 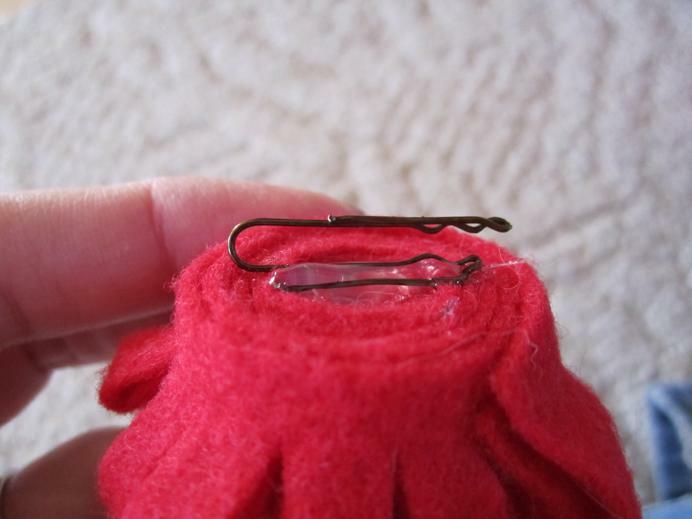 …and tying the ribbon to a hook that was already on the back side of the door to hang holiday wreaths. 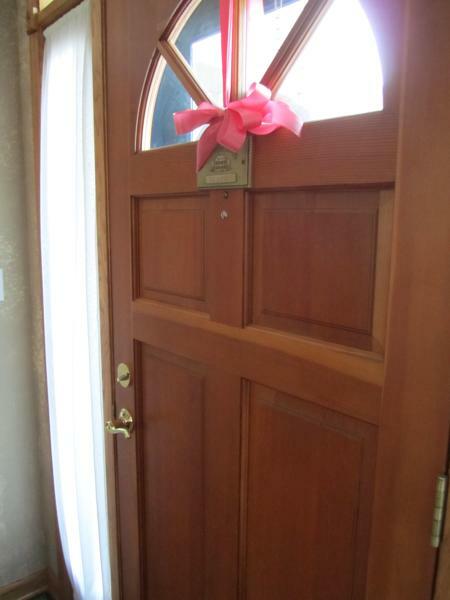 A bow gives the inside of the door a little decoration and hides the hook. 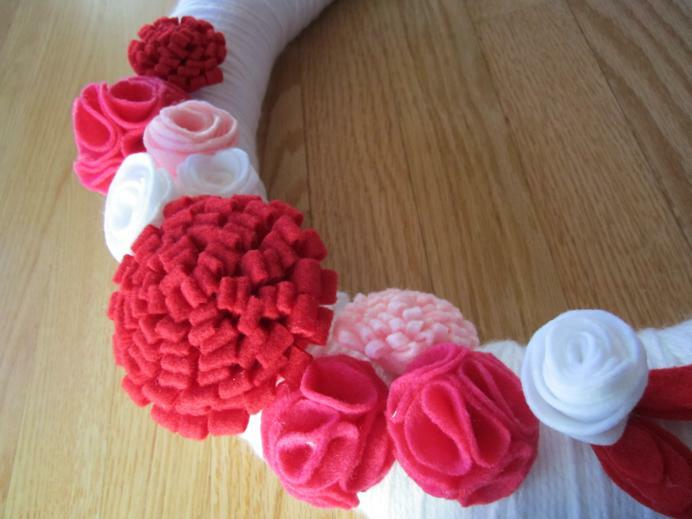 I’m excited to make more felt flowers and transform the wreath for various seasons throughout the year. At least for a few days we’ll have some Valentine’s Day festivity though. I ended up making a few too many roses, so the candles on our mantle got some dressing up for the season too. Working folks, I’m curious to know, how much pleasure do you get out of your home? Are you like I was before maternity leave forced me to slow down? If so, how can you change that? That’s one thing I’ll be thinking about when I go back to work! I’m a homebody, so I do tend to put a lot of effort into making our house a home (or in our case, our apartment a home, haha). But on the flip side, I am not very interior-decoratively-inclined, and I am often forget that Rome wasn’t built in a day and so I try to redecorate the whole house in one sitting. Now that we are house hunting, I am slowly building up inspiration photos and trying to narrow down decor I actually like, so that when we move, I can really make our new home into something we love and will want to maintain for years! So true – decorating can be really overwhelming, but I’m learning that baby steps count. I look forward to following your progress if you decide to blog about it! Oh my, I love the wreath. Especially how you made it versitile! !